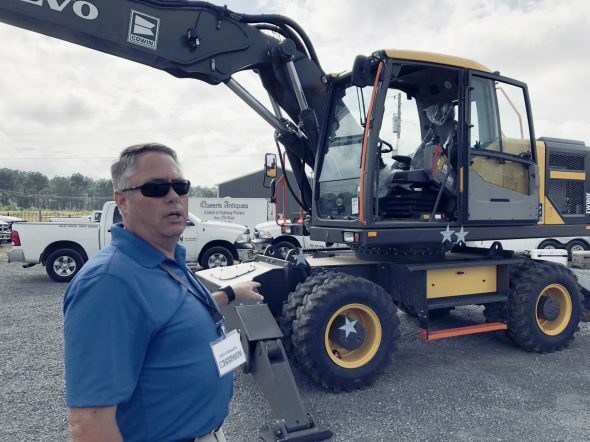 Construction Equipment Showcase - Cowin Equipment Company, Inc.
John Edwards of Cowin Equipment shows off the new Volvo Wheeled Excavator the Cullman County Road Department will use to maintain local roads and rights of way. The Cowin Team recently had the privilege of hosting a heavy equipment showcase in Cullman County. Choosing equipment for purchase or lease is made easy on our website, but it is always beneficial to be able to take the hands-on approach and view the machines up-close. Our goal is to provide customers with value-added equipment that will help get the job done efficiently and effectively. Opportunities to showcase the equipment allows people to get on the machines and get a feel for their size and power, and also gives us a chance to flex our muscles a little. An article in the Cullman Times, written byBenjamin Bullard, paints a great picture of our day. County plays host to construction equipment showcase.